1) Scoring the wiffle ball into the center portion of the backboard. Two points, when scoring from within the white lines, and three points when scoring from the half court mark. The WhirlyBall referee officiates from a mezzanine above the court — keeping score and calling all penalties. The referee’s word is final and can be bought…just kidding! Four Point Penalty for collisions with excessive speed. The penalty goes against the person most responsible for the collision. Referee judgment call. Four Point Penalty for pushing off with feet or hands against an opponent’s WhirlyBug™ or wall. Two Point Penalty for touching the ball with your hands unless it is wedged inside your scoop and is stuck there; or unless it goes inside your WhirlyBug™. Two Point Penalty for goal tending. Rising up in your seat to block a shot so as to be off your seat. You must keep your seat belt snug. Two Point Penalty for trying to free up the ball when it has been covered by opponent’s scoop on the floor or against the side of his/her WhirlyBug™. Head on collisions and directed collisions from behind are determined by a judgment call from the referee as to which team is responsible for its occurrence. In the event the ball gets smashed, the referee will make a determination as to which team last touched the ball, should a new ball be needed. No Admittance to the Court without WhirlyBall Staff Supervision. Keep One Hand on the Steering Column at All Times. No Play Allowed on the Court Unless from Operating WhirlyBug™. Do Not Use Hands to Pick Up the Ball From the Court Floor. Do Not Use Hands or Feet to Push off Wall, Bumper, or Other WhirlyBug™. Ramming from Behind will not be Tolerated and Player will be Ejected from the Court. Do Not Drive Full Speed into the Wall or Other WhirlyBug™, Remove Foot from Accelerator Pedal and Turn to Minimize Impact. No Eating or Drinking on the Court. 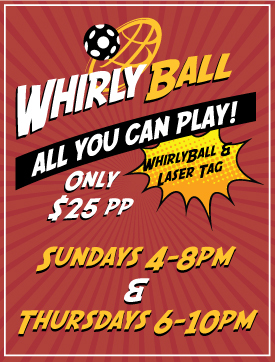 The game of WhirlyBall™ is inherently dangerous and injury is possible even if all rules are followed. If you are not willing to assume the risk of injury please do not participate. Failure to follow all rules or instructions may result in injury to yourself and others.